Ice cream may be my favourite food ever. I think I could probably give up chocolate and pizza and Thai curries and fish & chips and all sorts of other things if I had to, but ice cream would be the toughest. The smooth dairy creaminess, the cold sweetness, the nuances of whatever flavours are present, the sheer feel-good comfort value. It all adds up to a most wonderful sensory experience. There are casual ice cream eaters and there are real ice cream aficionados. The casual eater will consider ice cream as a dessert if the weather is warm. The true aficionado will consider ice cream at any time of day, at any time of year. In fact, it's possible that I eat more ice cream in winter than in the summer, because in summer there are more options available for sweet treats with all the fresh fruit in season. And yes, ice cream is a sweet treat, not something to be had every day, for even through my haze of fondness I know it's full of things that are less than nutritionally balanced. 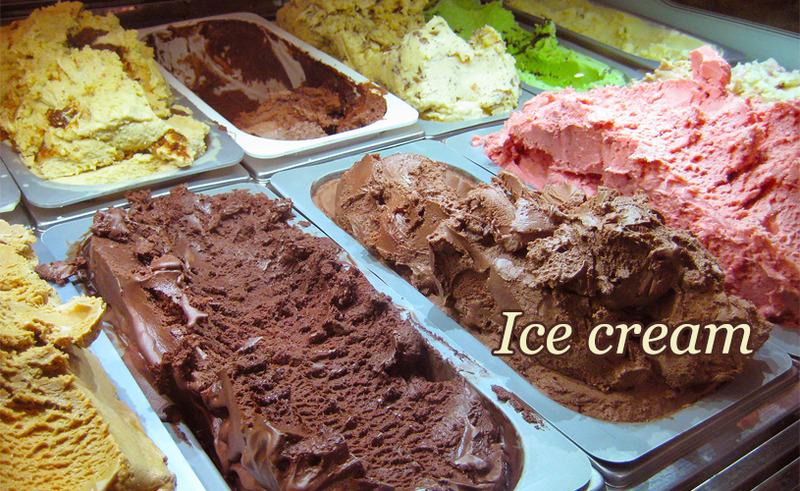 Ice cream is made primarily from, as the name suggests, cream, which is the fattier fraction of cow's milk. Then it contains a lot of sugar, for sweetness. And it's more sugar than you might imagine, because our taste buds don't work as well at colder temperatures. So you need a higher proportion of sugar to get the same perceived sweetness as something consumed at room temperature. Just melt some ice cream and drink it at room temperature to see how incredibly sweet it is. Next you need an emulsifier, which is an ingredient with the textural property that it keeps the fat (from the cream) and everything else smoothly mixed together, preventing it from splitting. ("Splitting" is a technical term used in cookery to refer to the undesirable event of fat separating from non-fats in a mixture. It is the major danger when working with molten chocolate or sauces containing cream, for example.) The simplest and most widely available emulsifier is eggs, whose proteins bind to the fats and help keep them smoothly mixed with the non-fats. There are two ways to incorporate eggs into your ice cream. The simplest is just to mix them in with your other ingredients and freeze it up as ice cream. Another way is to partially cook the cream, sugar, and eggs into a thin, runny custard, allow it to cool, and then freeze that. The custard method is preferred by people who are concerned about eating raw eggs. I've only ever used the raw egg method when I make ice cream (and I've made quite a lot over the years), and have never had a problem with it. Commercial ice cream manufacturers might use emulsifiers other than eggs, for example soy lecithin (a similar complex of organic molecules as the lecithin found in eggs) or carageenan (a similar substance extracted from seaweed). The next ingredient in ice cream is flavouring. It could be a splash of vanilla essence, or some artificially produced fruit esters, or it could be fresh fruit pulp or pieces, or chunks of chocolate and other things. You can add pretty much anything that might create an appealing flavour and texture. My favourite for home made ice cream is always freshly blended seasonal fruit. Chocolate ice cream is a little trickier to make, requiring either melting chocolate or obtaining an acceptable texture using cocoa powder. The final ingredient in ice cream is one you might not have guessed: air. 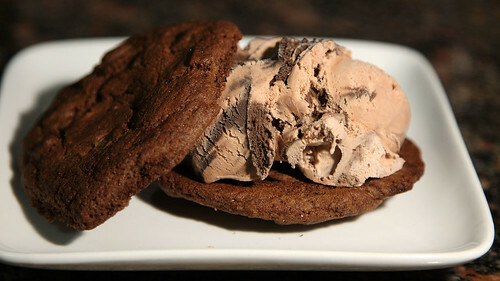 The mixture needs to be whipped to incorporate tiny air bubbles, which lighten the texture of the finished ice cream. Light, fluffy ice cream appeals to some people, while others prefer denser ice creams with less air, but they all have some proportion of air in them. Once the proto-ice cream has been mixed, it needs to be frozen. This part is trickier than it sounds. The water content in the ice cream freezes into ice crystals. But if you just plonk your mixture in a freezer, these crystals will form and grow and merge into one another, creating a solid icy slab. You need to mix the ice cream while it is freezing to break up the ice crystals into tiny fragments, ideally fragments too small to be detected by your tongue as you eat the result. If the ice cream isn't mixed enough, the ice crystals will be detectable, giving the final product an unpleasant icy texture. You can achieve this mixing by using an ice cream making machine which stirs the mixture as it freezes, or you can do it the old fashioned way by partially freezing the mixture, removing it from the freezer and giving it a good stir, putting it back to freeze a bit more, and repeating several times until it's fully frozen. Another way of keeping the ice crystals small is to freeze the ice cream really quickly, giving them not enough time to grow large. You can do this by, for example, stirring liquid nitrogen through your mixture. Some restaurants or gourmet ice cream outlets now use this method. The next step is to serve and enjoy your ice cream! This should be done within a week or so for fresh home made ice cream, because of the fresh ingredients with no added preservatives to increase the shelf life. Commercial ice cream can be stored for longer, but any ice cream will start to suffer after a while, especially if the container is pulled out for serving and returned to the freezer frequently, as ice crystals start to combine and enlarge. As well as basic ice cream there is a wide variety of related frozen treats. 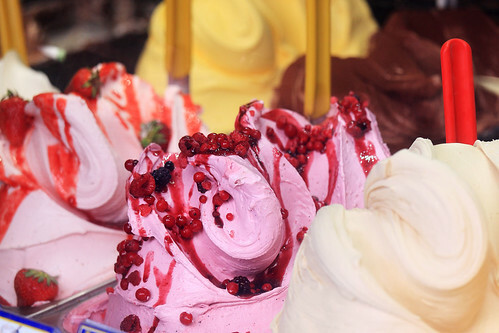 Italian gelato is made with a lower proportion of milk fat, replacing some or all of the cream with milk, or even leaving dairy out altogether for fruit flavours. A good mango or lemon gelato is a thing of wonder. Then there are sorbets and frozen yoghurts and a few other things in the ever widening circle centred on the idea of ice cream. When I was a child growing up, the fancy ice cream flavour was Neapolitan, with its stripes of vanilla, chocolate, and strawberry. I never liked the chocolate, because it was too bitter for my immature taste buds, and preferred the sweet sweet strawberry. But we mostly just got vanilla ice cream. The done thing back then was to add a topping, usually a strawberry or chocolate syrup designed specially for the purpose and sold in quantities by the supermarkets. But I preferred to sprinkle Milo on top (an Australian granulated chocolate malt product which is normally mixed with milk to make a drink, sort of like Nestle's Quik, but infinitely better because it's not so sickeningly sweet and the granules are large and satisfyingly crunchy). 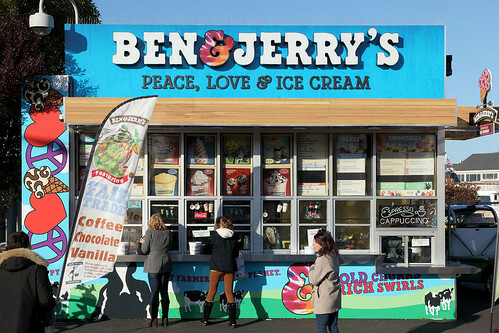 Ben & Jerry's stall, San Francisco. 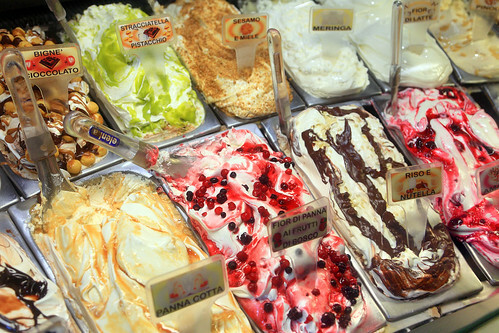 Nowadays there are hundreds of gourmet ice cream flavours available. I saw "Murray River salted caramel" in a shop the other day. But one of my greatest ice cream epiphanies came on my first visit to the United States, when I was introduced to Ben & Jerry's. Their ice cream has less air than most other brands, so it is denser, and the flavour combinations they have come up with are incredible. Cherry Garcia was the first flavour I was introduced to, and is still probably my favourite of their selection. Alas, at the time, Ben & Jerry's did not export ice cream to Australia, so it was several years before I got to try it again. On a few trips to the USA, I made sure to get plenty of it each time, knowing it would be years before my next chance. One time I picked up a tub on the way to LAX airport, and passed it through the security x-ray machine so I could eat it while I waited to board my flight. Ben & Jerry's eventually arrived in Australia a few years ago but, despite my affection for it, it is so ridiculously expensive that I have never bought it here. For some reason the freight costs manage to more than quadruple the price compared to what one pays in the USA. Perhaps it's a good thing. If it were cheap here I'd probably eat too much of it! Ice cream is not merely a sweet treat. For many people, including me, it conjures memories of the lazy days of childhood. Summers at the beach. Curling up under a blanket on a winter's night in front of the TV. Strolls along the streets of Rome or the calle of Venice. Dessert in a favourite cafe because they have better ice cream desserts than anything in the restaurant down the street where you just had dinner. Sprinkles and syrups and crunchy bits and smooth creamy sweetness. I've experienced many Americans, in particular, being extremely concerned about the possibility of salmonella poisoning from eating raw eggs. In Australia, I don't think I've ever met anyone who had this concern. It seems to be "a thing" in the USA, and very much "not a thing" in Australia. I surmise that perhaps the salmonella infection rate of eggs in the US might be significantly higher than it is in Australia. EDIT: A reader wrote in to explain this difference. Apparently in the USA, eggs are washed before being sold to consumers - simply to make them look nicer. This washing removes the outer protective layer, known as the "bloom" on the eggs, and actually significantly increases the risk of salmonella and other bacteria penetrating the shell to infect the interior. In contrast, in the European Union, washing eggs before sale is actually illegal, because it increases the risk of dangerous bacteria in the egg. I suspect the same must be true in Australia, because the eggs I buy at the supermarket have very obviously not been washed, and salmonella in eggs is not a concern. Here's a reference explaining the whole thing. Last Modified: Saturday, 2 August 2014; 16:06:02 PST.